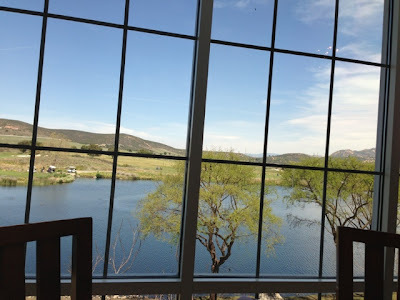 I just love the Sage Cafe at the Barona Resort and Casino in Lakeside. I have written about the Sage before, but that was quite a while ago (2009). It was time for a new experience -- lunch! Weeeell, the menu does not change from lunch to dinner with the exception of their yummy prime rib dinner being served starting at 4pm nightly oh, AND, the fact that they only serve hot, fresh complimentary Indian fry bread only after 4pm also. Booooo. The Sage Cafe is Barona's 24-hour restaurant and it is lovely, I repeat, lovely. 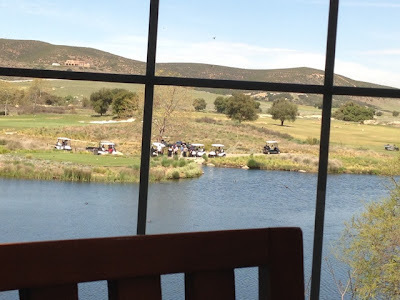 The outside patio overlooks the beautiful, green golf course. The wait staff is friendly and the prices are reasonable for what you get. I do think that the Asian cuisine on the menu is overpriced, given the authentic food we can get elsewhere. But, hey, no tax on food either. The hubby and I ventured out on a Thursday afternoon for lunch. We asked for a table out in the patio. It was such a beautiful day out. There was even some sort of golf cart drama across the way. We chuckled because it appeared that every person on staff came to see what was going on with, what it looked like, a golf cart being stuck. Like I mentioned, the bread basket arrived and to our surprise, there was not one piece of fresh Indian fry bread. The table didn't have cinnamon sugar or powdered sugar either. After 4pm, the server stated. Got it! I craved fried chicken so what better combination? Chicken and waffles! With the nearest Roscoe's being in Long Beach... I thought I'd give this version a try. Why not? 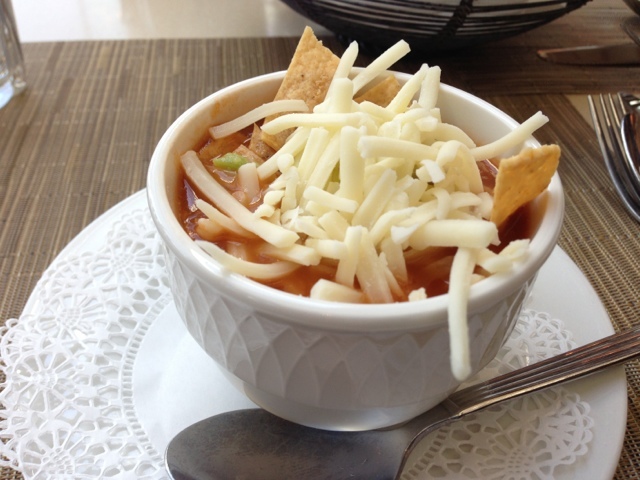 Before my sweet and savory dish arrived, my cup of chicken tortilla soup was served. 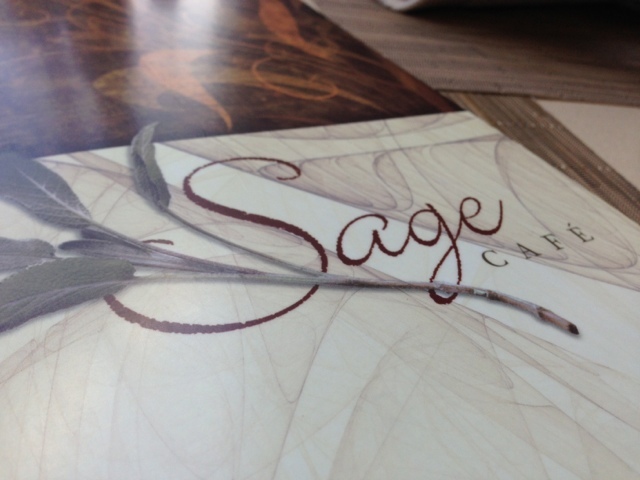 Each entree at the Sage (non-breakfast item) comes with a choice of a cup of soup or a wedge salad. I love their chicken tortilla soup. The warm broth, cool avocado chunks and crunchy tortilla strips were great textures in every bite. The broth, this time around, wasn't as flavorful as my past visits, but overall it was still good. Ta-da! 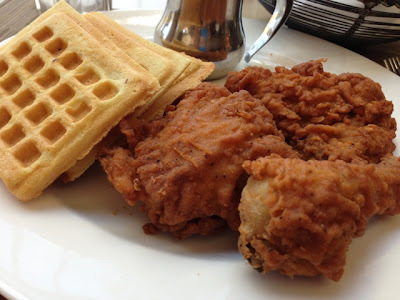 My "all dark" meat chicken and waffles ($8.95) was served. The dish was pretty boring in presentation, but oh my, I was pleasantly surprised how crunchy and flavorful the spices were on the chicken. The meat was super juicy inside. The people sitting two tables away could have heard my crunch (if there wasn't any talking). It was that crunchy. I loved every sinful bite. I got a leg, thigh, and a small piece of bone-in breast. So much for all dark meat, but man, it was still juicy! Seriously, this picture does NOT do justice of how the fried chicken tasted. The waffles were just okay. 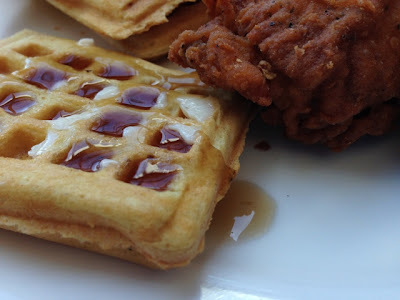 They didn't have the crispiness and warm doughiness that I liked, but the sweet syrupy waffle and savory chicken still went well together. Cute square waffle, you still did your job. 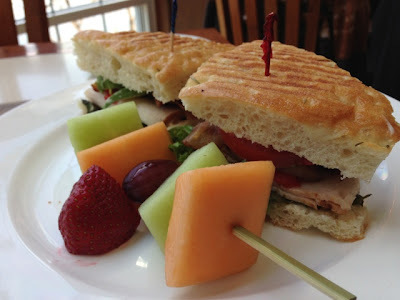 The hubby ordered the turkey club BLT panini with a side of fresh fruit kabobs ($8.95). Sandwiches and burgers have a choice of steak fries, cole slaw, onion rings or fruit. I didn't have a taste of his dish because I certainly was enjoying all my delicious flavors on my palate. 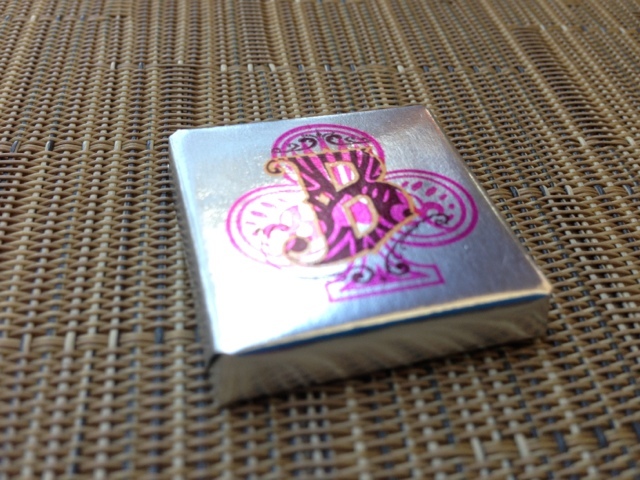 No dessert for us, unless you count the square foiled chocolates they gave us with the check. The Sage Cafe is a definite gem because of the quality of their food, service and of course, their non-tax prices... and, who knows, you may get lucky on the slot machines or tables! Hmm... I could be convinced to go to Barona for fresh Indian fry bread... what a great treat! You can't get that in a lot of places anyway. Too bad you missed it this visit! 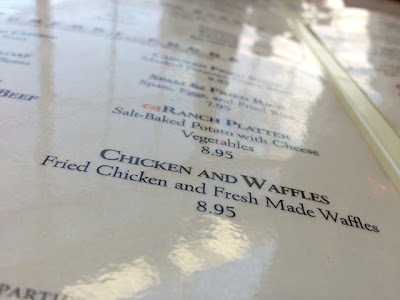 The chicken looks good but the waffle looks ordinary. Oh well. Nice to know there's a good place to eat at Barona! Haha, yeah the waffles were sad, but I ended up eating them anyway. Next time, I will order the fried chicken dinner... ooh, with mac n cheese. YES, going for dinner and getting the complimentary fry bread alone is worth the trip out to Barona. You and Jake have to go! Thank you for sharing posts about awesome local eats! It’s so helpful to stay in the loop, discover new and different things, and feel connected to the community we live in and love. I’m writing to let you know that I’m hosting a Dishcrawl. It will be on Wednesday, June 12th at 7pm, in Carlsbad Village. You’d love it! During Dishcrawls, guests get to visit four restaurants, enjoy the specialties at each one, meet the owners, managers or chefs, and have fun socializing with fellow food lovers. It’s like a pub crawl, but with all kinds of food to devour! Carlsbad Village is such a charming part of town with its historic buildings, and it’s known for having a great North County downtown scene. You can view the event online at dishcrawl.com/carlsbad. We hope that you can join us and help us spread the word! I’ve also included a press release about our Dishcrawl debut in Carlsbad Village below. Please feel free to contact me anytime, and we hope to see you there! The popular Bay Area start-up whips up social food adventures in North County San Diego. Carlsbad, CA - May 21, 2013 - Dishcrawl, a social dining start-up that brings communities together through great food and great company, is coming to Carlsbad in June! 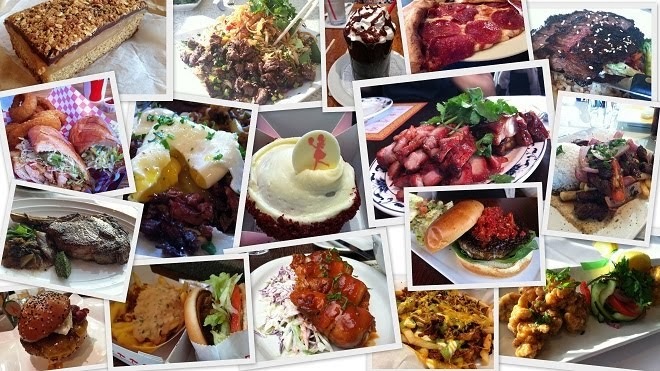 Dishcrawl takes food lovers to four delicious restaurants in one evening. It’s like a pub crawl - except that Dishcrawls spotlight food dishes instead of drinks. Dishcrawl introduces its social food adventures to Carlsbad Village, North County’s most charming beach town. The beautiful historic buildings and great downtown scene capture the hearts of visitors and locals alike. Dishcrawl’s mission is to bring together local chefs, food lovers and truly delectable dishes. Dishcrawl tickets can be purchased at dishcrawl.com/carlsbadvillage! As part of the fun, the names of participating restaurants are kept top secret until two days before the event. Then, the first restaurant on the Dishcrawl gets revealed! Ticket holders are given clues about participating restaurants in the weeks leading up to the big night. To stay in the loop about Dishcrawl Carlsbad, visit dishcrawl.com/carlsbad, check out our Facebook or follow @DishcrawlCarl. Dishcrawl creates dining experiences and events to satisfy anyone’s craving. Our mission is to show food lovers the best dishes in local restaurants. You can find your local Dishcrawl Ambassador leading you through progressive dinners, prix fixe dinners, and other fun food events! Dishcrawlers can enjoy dining experiences in San Francisco, New York, Montreal, Ottawa, San Jose, Toronto, Philadelphia, DC, and more. Visit Dishcrawl.com for a local dining experience.